Annabelle's brother: Fort Sumter has been fired upon. Mr. Lee: Then the war is here. Annabelle's brother: Yes, dad, and I'm going to be one of the first to enlist. Q: What's the name of that thing Buster Keaton is sitting on? Q: Why is the music so bad? I haven't had so much fun watching a movie for a long time. 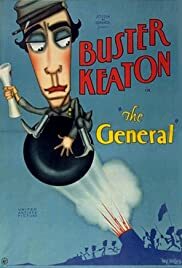 The General is a silent comedy (mostly slapstick) about Johnny Gray, a train engineer with two loves: his engine and Annabelle Lee. Annabelle soon dumps him because of his failure to enlist into the Civil War (they would not take him because he was too valuable as an engineer). Things are then sped up a year, where we see some Union commanders planning to hijack a train to unleash a highly sophisticated master plan. As it so happens, they steal Johnny's engine, a big mistake. Buster Keaton does a phenomenal performance as Johnny. His face and character is ideal for this type of comedy. He reminds me a lot of Leslie Nielsen from the Naked Gun movies (but, of course, less old). He is often ignorant of what is going on around him, leading to plenty of laughs. This also makes him a very charismatic character. There are countless train related jokes. The first one comes right at the beginning, when we see Johnny being followed by two kids and a woman, in a line much like a train. 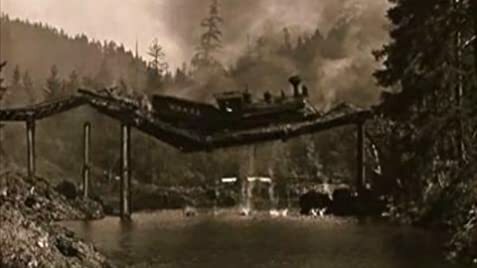 The bulk of the movie is made up of Johnny running a train, either chasing or fleeing from the Union soldiers. The movement and maneuvering of the trains is beautiful. The stunt work is an incredible accomplishment. The finale is explosive. The General was a lot of fun to watch. It gave me more laughs than most modern comedies, and had plenty of substance on top of that. This is enough for me to label it as one of the greatest comedies ever. After my first viewing, it instantly became one of my favorites. It is timeless gem that should be watched at least once by anyone interested in movies.